Bill Callaghan is a man who has seen many things and been to many places. He’s a former army medic and RNLI crewman. He’s a stand-up historian and poet. His work and passions have taken Bill all over the world. We’ll be seeing more of Bill in the coming months on this blog as he takes his British-built Toyota Avensis around the UK, showing us his secret places and telling us in his own style how history is not always what it first appears. 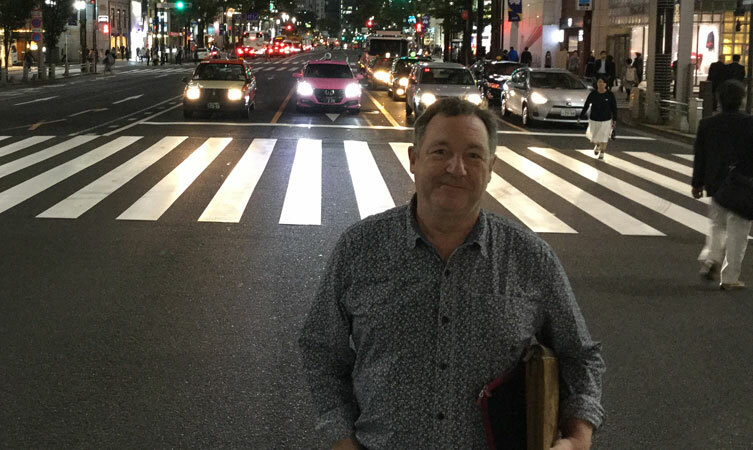 But to kick off the series, we thought we’d invite Bill to Japan – a place where he has never been to before – to visit the Tokyo Motor Show, to see the home of Toyota and have a glance into its future. Here’s how he got on…. Compared with the experience of the auto journalists on this trip I’m a complete newbie, but I’m looking forward to the Tokyo Motor Show. It’s the first night in Japan and I’m getting down with the culture at a Japanese tea ceremony – not bad range of movement for my steel knees! As for dinner, well, these guys are food artists. Mat Watson from Carbuyer took this video showing really awesome skills on display. I’m having a great time at the Tokyo Motor Show. I drive a car but, like most I guess, have little idea what a multitude of design ideas and disciplines go into making it. I’ll be honest, I usually buy a car that I: a) can afford, b) like the look of, and c) can expect to do the task. I probably spend more time deciding my wardrobe choices (not today, I feel ridiculously underdressed). I have been doing a great disservice to the engineers that make these wheeled miracles: chemists, physicists, ecologists, ergonomic engineers, electrical engineers, computer gurus, mechanics, artisans and I guess hundreds of different more folk with degrees in ‘ics’ and ‘ologies’. In much the same way as non-medics don’t like to think too hard about what goes on under the skin of their own bodies, I’ve given scant regard to what might happen under the bonnet of a car or in the tread of its tyres or the padding of its seats. Thankfully some very clever people do that for us. As I say, I’m having a great time at the Tokyo Motor Show. Early start to get to the Fuji Speedway today and observe the press launch of some of Toyota’s design concepts and strategies for fuels, new cars and upgrades to existing models. Tokyo is huge with a population I’m told of 34 million people… Driving out of the city at that time in the morning should have been awful but it was a joy to see the city’s engineers have the traffic flow sorted. Sadly, Mount Fuji was veiled in cloud but as the old proverb goes: “If you can see Fuji it will soon be raining. If you can’t see Fuji, it’s raining.” Of course, it helps if you’re looking in the right direction. The cars on show are just fabulous bits of engineering. Sadly, I lack the wherewithal to go into torque ratios, fuel optimisation, or whether 700bar is better than 350bar; I lack the nuance to gauge whether a fastburn piston makes any difference, though I guess it must as the auto writers were keen on it. I did get to drive the fabled Land Cruiser again, after a quarter of a century’s absence. The last time I was behind the wheel of one, it was in the desert of Saudi Arabia and had a manual shift. Today, it was at a test track and the Land Cruiser had an automatic gearbox. Muscle memory is a curse sometimes – and the great big brake pedal is NEVER A CLUTCH. The ignominious squeally sudden stop hurt more than my pride. Sorry guys! I fell in love with a machine, the iRoad. It’s electric and can do 40km on one charge. Its motion is inspired by downhill skiers, but was reminiscent of the old Messerschmitt trike things I saw as a boy. They are a real commuting solution, but the designers told me that a roof bar for my kayak is out of the question! There are only 40 iRoads in the world and with their R&D outlay each one is currently worth more than a Ferrari. I know which I’d rather drive… give me the plug! What really fired my rockets today was to meet a couple of engineers that could well be considered for a Nobel Prize in medicine. Yoshihama Yuki will never know how many lives he’ll save with his pedestrian detection system. I was in the front seat in the demo vehicle and it was a frighteningly accurate scenario, but the car stopped before it hit the dummy as it ran out in front of us. I know that in those 30-odd years my intervention has saved perhaps a dozen lives. These guys will save thousands. 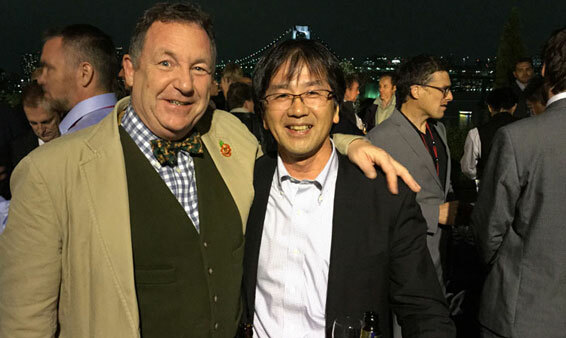 Later I met his boss, Toyota’s Safety Sensei Seigo Kuzumaki. He told me that his team are developing the radar (Best of British inventions! Robert Watson Watt 1933) and camera based systems to improve night detection. This facilitates an appropriate response and preps the medics’ expectations intelligently before they’re on-scene. As an Army Medic of 23 years service and as a lifeboatman with eight years on crew, I know that in those 30-odd years my intervention has saved perhaps a dozen lives. These guys will save thousands. The morning was spent in search of some culture. I wanted to find a temple, enjoy the tranquility of the immaculate gardens and feel at peace with the world. It was, I think, an arrogance to assume that of the 34,000,000 people in Tokyo, I’d be the only one to think like that – the place was heaving with humanity! There was little by way of serenity but I did manage to get a souvenir or two. In the afternoon we were off to Tokyo Fashion City (I’m not making this up!) where Toyota has a trial centre for ITS; (Please work that out for yourselves, they told me but I’ve totally forgotten what it means.) [Intelligent Transport System – editor]. I need not have worried. It’s amazing how you can get relaxed with this technology in a short space of time. The developments weren’t all integral to the car. Aomi (meaning “blue ocean”) is a networked system of cameras and radar, fitted to regular street furniture, that communicates with the vehicle to warn the driver of unseen hazards around corners and on blind right turns. Essentially it’s a periscope system. I was greatly impressed that the engineers on these projects thought more about solving the engineering problems than the life-saving consequences of their work. I don’t think like an engineer. I think (if I think at all) like a medic and I love this application of engineering! My hope is that the tech will be shared, that highways agencies will understand the vision and potential scope of this work and co-operate to make the world’s roads so much safer. The last evening was spent getting cultural in a wonderful sushi restaurant and later in a dive bar with some outrageously friendly locals. I’ll miss the place.